Here you can find a code snippet about how to enable specific fields of your ALV to be F4 responsive with a custom programmed search help. 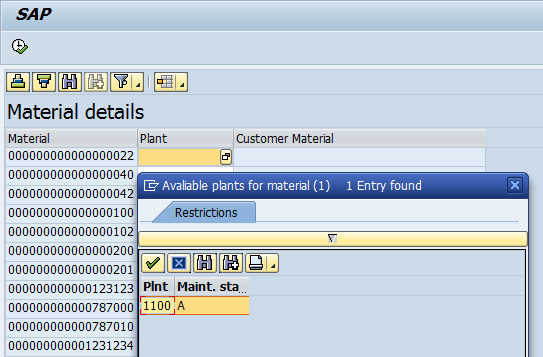 CLASS lcl_application DEFINITION CREATE PRIVATE. ty_t_alv_lines TYPE STANDARD TABLE OF ty_s_alv_line WITH DEFAULT KEY. mo_grid      TYPE REF TO cl_gui_alv_grid. get_instance RETURNING VALUE(ro_instance) TYPE REF TO lcl_application. mo_instance TYPE REF TO lcl_application. FROM mara UP TO 50 ROWS.
" hide these all the time                       "
ls_f4 LIKE LINE OF rt_f4. lr_table        TYPE REF TO data. CREATE DATA lr_table LIKE it_table. LOOP AT rt_fcat ASSIGNING FIELD-SYMBOL(<ls_fcat>). ty_t_marc TYPE TABLE OF ty_s_marc. lt_ret  TYPE TABLE OF ddshretval. DATA(ls_line) = mt_alv_data[ es_row_no-row_id ]. CHECK lt_marc IS NOT INITIAL. IF sy-subrc = 0 AND lt_ret IS NOT INITIAL. READ TABLE lt_ret ASSIGNING FIELD-SYMBOL(<ls_ret>) INDEX 1. DATA(lt_fcat) = me->get_fcat_4_itab( me->mt_alv_data ). *      SET HANDLER me->alv_toolbar FOR me->mo_grid. *      SET HANDLER me->alv_button_click FOR me->mo_grid. *      SET HANDLER me->alv_user_command FOR me->mo_grid. *      SET HANDLER me->alv_data_changed FOR me->mo_grid. *      SET HANDLER me->alv_hotspot      FOR me->mo_grid. SET HANDLER me->alv_on_f4        FOR me->mo_grid. me->mo_grid->register_edit_event( i_event_id = cl_gui_alv_grid=>mc_evt_enter ). me->mo_grid->register_edit_event( i_event_id = cl_gui_alv_grid=>mc_evt_modified ). This entry was posted in ABAP, ALV, ALV tutorial, Development, Dynpro and tagged ABAP, ALV, F4, F4IF_INT_TABLE_VALUE_REQUEST by Spider. Bookmark the permalink.